Avon Fire & Rescue Service has welcomed the outcome of a court case in which the former manager of a restaurant in Weston-super-Mare was successfully prosecuted for failing to comply with the Regulatory Reform (Fire Safety) Order 2005. Mr Karim Miah, who used to manage the restaurant formerly known as the Pink Leaf in Alexandra Parade, appeared at Weston-super-Mare Magistrates Court this week charged with failing to comply with a prohibition notice served on the restaurant in 2009. Back in August 2009 members of the Avon Fire & Rescue Service fire safety team visited the Pink Leaf restaurant to carry out a routine inspection. They found that there was no adequate means of escape for staff and customers using the first floor should a fire occur. A prohibition notice was served on the premises to prevent the first floor being used, however in October 2009 a routine visit by North Somerset Council’s licensing team found the first floor in use and they notified Avon Fire & Rescue Service. An investigation was carried out and resulted in Mr Miah appearing at Weston-super-Mare Magistrates Court on Tuesday 1 February where he pleaded guilty to the offence and was fined £500 and ordered to pay £750 in costs. Head of Fire Safety for Avon Fire & Rescue Service, William Roberts, said: “This is a great result for the team who have worked hard to secure this conviction. Part of the role of the fire and rescue service is to enforce the Regulatory Reform (Fire Safety) Order and ensure all business premises and public places comply so members of the public are safe when inside. 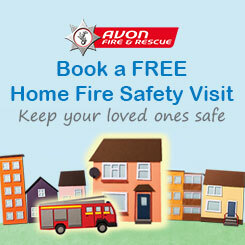 Avon Fire & Rescue Service works closely with businesses to ensure they comply with the regulations and staff are available to offer practical advice and assistance in this area.